Here’s a look at what’s coming out from DC for May 2015. A full list of solicitations are available here. The Convergence event ends this month, as DC completes its move out west. While DC’s announced the post-Convergence lineup (a retweaked New 52 basically), it remains to be seen what’ll happen to our old pre-New 52 favorites: cannon fodder? Getting to live out their lives on their respective Earths? Folded into the New 52’s main Earth?! (Let’s hope for option #2.) Of course, one will be better off cost-wise buying the trades for all of these. 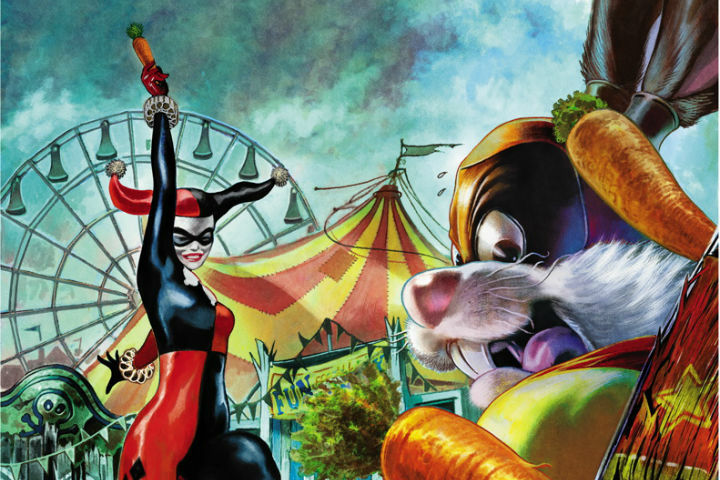 Still wonder how Harley’s supposed to be a match for Captain Carrot and the Zoo Crew—did she eat one of Cap’s cosmic carrots? Also wonder if Fastback’s in this month’s “Flash” issue, too. “Batman ’66” is introducing its own versions of Clayface and Solomon Grundy. Elsewhere Bat-wise, “Gotham Academy” is getting its first trade paperback.